Epidemiology and gene sequencing technologies have been used by researchers in the UK, the Kingdom of Saudi Arabia, the US and Canada to show that the novel Middle East Respiratory Syndrome (MERS) coronavirus can spread between people in healthcare settings. The work is published in the New England Journal of Medicine today. The scientists, from the Saudi Arabian Ministry of Health, UCL, Wellcome Trust Sanger Institute, University of Toronto, University of Colorado and Johns Hopkins University, rapidly investigated and defined the epidemiology, transmission dynamics and genetic composition of the MERS-CoV cluster of 22 cases of healthcare-acquired MERS coronavirus infections from a recent outbreak in Al-Hasa, Eastern Province, Kingdom of Saudi Arabia. By combining clinical monitoring techniques with state-of-the-art sequencing technology to study the outbreak, the team discovered that transmission occurs within hospitals and can be rapidly fatal. Of the 22 people diagnosed with the coronavirus infection in this outbreak, 65 per cent of patients have died. Until now, little has been known about the origin and characteristics of this deadly new virus but this work has uncovered the transmission dynamics, and clinical and genetic characteristics of this often fatal virus. The fact that the hospital outbreak was contained effectively and there were no more new cases reported, shows that preventive infection control measures are crucial to prevent spread of the virus. "We developed our rapid, deep, and whole-genome sequencing of MERS coronavirus to understand more about the genetics of this virus, and for the method to be used in any new outbreaks. This is exactly what we have been able to achieve," says Professor Paul Kellam from the Wellcome Trust Sanger Institute and the UCL Research Department of Infection. The Sanger Institute team developed a deep sequencing technique that can rapidly sequence MERS coronavirus genomes. This technique uses the miniscule levels of viral genetic material present in patients' clinical samples taken to diagnose the infection. Coupled to bespoke computer programs this process reduces the time of genome analysis from weeks to days. "By analysing the complete genomes of four MERS-coronavirus-positive samples, we found that the viruses were closely related to one another genetically - indicating that they are part of the same infection outbreak," said Dr Abdullah Al-Rabeeah, Minister of Health, Kingdom of Saudi Arabia. "The low level of sequence divergence of the virus within the Al-Hasa cluster is in concordance with the hospital epidemiological investigation, suggesting that transmission took place within this group of patients and healthcare workers." Using this knowledge, clinicians have been able to minimise the spread of the infection and provide vital new information for helping to contain future outbreaks. "The fact that the hospital outbreak was contained effectively and there were no more new cases reported, shows that preventive infection control measures are crucial to prevent spread of the virus," said UCL's Professor Alimuddin Zumla who is supported by the National Institute for Health Research University College London Hospitals Biomedical Research Centre. "The rapid pace with which analysis of the cluster outbreak at Al-Hasa was initiated by the Saudi Arabian Ministry of Health, enabling rapid definition of the epidemiology, identification of viral genome sequences and release of them for open use in the GenBank database, helped bring the outbreak under control," continued Professor Zumla. "This reflects the true collaborative spirit and value of effective international collaborations, which are essential to containing this virus." Prevention of the transmission of MERS coronavirus is still a major challenge for healthcare workers. Further research into the duration of contagiousness as well as the complete spectrum of disease is needed to help healthcare workers develop and implement new strategies to tackle this growing issue. Professor Ziad Memish, Deputy Minister of Health, Riyadh, Kingdom of Saudi Arabia, said: "The Saudi Ministry of Health staff were honoured to work with local and international world leaders in hospital epidemiology, infectious diseases, virology and gene sequencing experts to understand and define the complex cluster of the novel MERS-coronavirus in the eastern region of the Kingdom of Saudi Arabia, not just to put local interventions to contain the outbreak, but also for updating and evaluating existing WHO Global Infection Control guidelines for MERS-coronavirus. "Whilst there remain many unknowns about this new lethal virus, the Saudi Ministry of Health is committed to continue its collaborative work with all national and international experts under the umbrella of the World Health Organisation to unravel the mysteries of this novel virus." 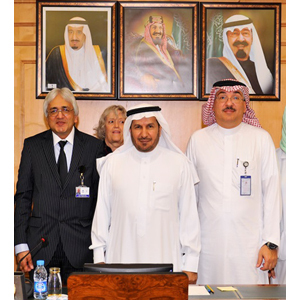 Image caption: Professor Alimuddin Zumla, UCL Research Department of Infection (left), with Dr Abdullah Al-Rabeeah, Minister of Health, KSA (centre) and Professor Ziad Memish, Deputy Minister, KSA (right). The work was supported by the Kingdom of Saudi Arabia Ministry of Health, the UCL Hospitals NHS Foundation Trust, the National Institute for Health Research University College London Hospitals Biomedical Research Centre, the European & Developing Countries Clinical Trials Partnership, the US National Institutes of Health, the European Community's Seventh Framework Programme and the Wellcome Trust.